Audrey Rose and Thomas Cresswell find themselves aboard a luxurious ocean liner that becomes a floating prison of horror when passengers are murdered one by one...with nowhere to run from the killer. 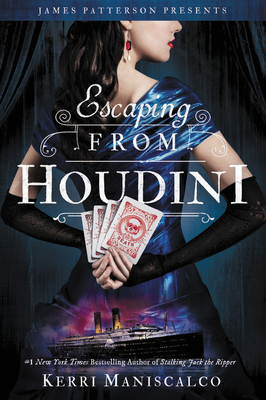 The #1 bestselling series that started with Stalking Jack the Ripper and Hunting Prince Dracula continues its streak in this third bloody installment.... Embarking on a week-long voyage across the Atlantic on the opulent RMS Etruria, Audrey Rose Wadsworth and her partner-in-crime-investigation, Thomas Cresswell, are delighted to discover a traveling troupe of circus performers, fortune tellers, and a certain charismatic young escape artist entertaining the first-class passengers nightly. But privileged young women begin to go missing without explanation, and a series of brutal slayings shocks the entire ship. The strange and disturbing influence of the Moonlight Carnival pervades the decks as the murders grow more and more bizarre. It's up to Audrey Rose and Thomas to piece together the gruesome investigation before more passengers die before reaching their destination. But with clues to the next victim pointing to someone she loves, can Audrey Rose unravel the mystery before the killer's horrifying finale? "Maniscalco has created a serious, sharp-minded, and forward-thinking protagonist in Audrey Rose, whose fearlessness will endear her to readers looking for an engaging historical thriller. Abundant red herrings and a dash of romance round out this gruesome but engrossing story." *"This audiobook has everything: a true-life tale that has intrigued readers for 100-plus years, a young woman who balks at the constraints put upon women during the Victorian era, a marvelous yet somewhat gruesome mystery, and a narrator who brings you down into Spitalfields as Jack the Ripper earns his name. A must-have." "Audrey Rose Wadsworth prefers breeches to ball gowns, autopsies to afternoon tea, and scalpels to knitting needles. Though her father, Lord Edmund, has forbidden it, Audrey covertly studies forensic medicine...while "the Ripper" remains two steps ahead, lurking where Audrey least expects....Maniscalco's portrayal of scientific invention in a newly industrial era will serve as a fine first foray into Victorian classics." "Audrey is a young woman eager to use her brains and willing to flaunt society's rules....This mystery pays homage to classics like Doyle's Sherlock Holmes and Mary Shelley's Frankenstein [and] will satisfy those readers looking for historical mystery, a witty heroine, and a little romance." "Audrey Rose is a smart, fearless, and progressive heroine. Plenty of red herrings, a conspicuous absence of blood, and a developing romance make this a must-read." "Readers of the previous mystery will be thrilled to have more of this likable duo. [A] delightful romp into an 1888 Gothic mystery with a hint of romance." "There are plenty of suspects and red herrings as well as tense escalations....A scenic, twisty mystery."